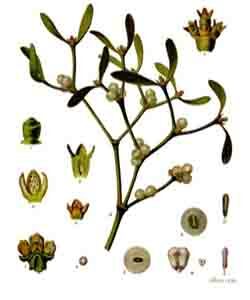 Viscum album is also known as European-mistletoe. It is a plant, which is semi parasitic it grows on numerous kinds of trees in areas which are temperate, worldwide. It has been employed in traditional medicine over centuries to treat headaches, flu and seizures as well as other conditions. The Druids had a high regard for mistletoe. It was only gathered when the druids stated they had visions telling them to seek it. If a considerable length of time went by without this happening then it was thought of as an bad omen, specifically that something bad would happen to the nation. Mistletoe is of course very popular at Christmas time. The leafy shoots as the berries of the plant are employed to make extracts, which can be taken orally. The extracts are available in Europe on prescription. It is administered by injection. In the U.S the injection is only available in clinical trials. There have been some laboratory studies have shown that mistletoe destroys cancer cells as well as stimulate the immune system. Over 30 clinical trials have been studied which show the usage of mistletoe in treating cancer. There have been good reports. In raw and unprocessed form, it is poisonous. If eaten raw it can cause a reduction in your heart rate, seizures, vomiting and even death. American viscum is not safe if used for medicinal purposes. In countries where it is commercially available by injection the extracts are believed to be mostly safe. Side effects, which are not very common, include flu like symptoms low-grade fevers as well as extensive skin reactions.